1) If you’re reading this, I just wanna say Happy Holiday’s and thanks for the read. I’m always interested in what folks think of the playlists. Feel free to drop a line. I am appreciative of any feedback you might provide. 2) This week’s playlist is taken from a 90 minute class I teach during the cycling off-season. It’s the holiday season so I sprinkled in some holiday music. 3) The key to teaching a 90 minute class is to effectively chunk the class. By dividing the class into discernible segments, riders achieve success multiple times. The playlist contains four 20 (ish) minute segments. One of the segments is an FTP test. 4) I’m working to tidy up my notes… please let me know if I can make them more useful to you. 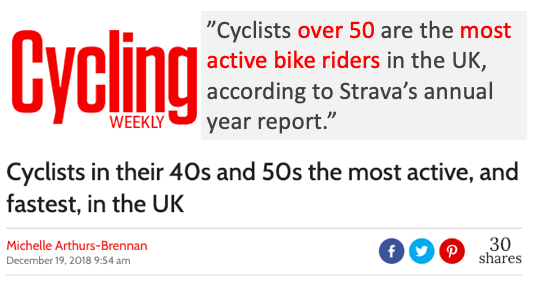 5) According to Cycling Weekly, British riders in their 40s and 50s are the fastest and most active group. We’ll explore this phenomena more in the coming months. Cycling truly does give back to you. 6) We did an FTP test in November. Here’s the post which introduced the effort. 7) This is the follow-up post to the FTP test. Both are worth the read. 8) Here’s a video from Stages Cycling explaining FTP. 9) . We channel Frida Kahlo for motivation. I really like her use of identity in her work. That’s like an FTP test. It’s you looking in the mirror and seeing where you are. The Brooklyn Museum will host a Kahlo exhibit in 2019.. Worth checking out.